Nurses have a pivotal role in improving patient care is diverse health care systems. The associate degree in nursing program (ADN or ASN) seeks to prepare nurses to fill such as role. But as the State of Massachusetts seeks to advance the IOM’s recommendations in the Future of Nursing report, it is critical that ADN-graduates become forward thinking to complete the BSN degree. Massachusetts is one of only nine states that have been recognized by the Robert Wood Johnson Foundation for its drive to produce a more highly educated nursing workforce. Studies show that a better-educated and diverse workforce will positively impact patient outcomes. Therefore, ADN students should understand the value of the BSN and seek to continue their education sooner rather than later. A registered nurse’s responsibility depends on training and expertise. Traditionally, RNs provide health education and coaching, perform patient outreach, manage complex care, lead teams, run specialized care services, and provide independent visits. The expanded role of nurses can include more complex tasks. Given this expanded role, it is understandable why RNs need to upgrade their education and change along with the rest of the health care team. The ADN program equips students with a level of competency to perform bedside activities with minimal supervision. However, continuing education comes with an opportunity to develop a deeper set of clinical skills and critical thinking to make life-changing decisions on the go. All in all, nurses are trained and skilled healthcare providers who not only perform medical tasks but also collect and contextualize information to make decisions in the best interest of their patients. They sympathize with patients and their families, offer emotional support, and are unrelenting advocates, which makes the care they provide a critical part of patient recovery. The associate’s degree in nursing program produces professional nurses who are able to improve the lives and health of individuals, families, and communities. Students learn how to provide evidence-based practice with an emphasis on multidisciplinary care and function as a leader and manager of health care. For an enhanced learning experience, the curriculum will blend theory with hands-on learning opportunities that include practice alongside experienced professionals. The practical learning opportunities will begin in a modern simulation lab followed by a supervised clinical experience at prestigious health care facilities. Most programs require full-time attendance so the curriculum may be completed within two years. Students may need to complete the course prerequisites and non-nursing courses before commencing the core nursing sequence. With a goal to prepare students to provide total patient care within the guidelines of legal principles and ethical values, the curriculum will critical topics. Nursing courses will include the fundamentals of nursing, essentials of health assessment, nursing science, nursing leadership, introduction to professional nursing, principles of pathophysiology, maternal child nursing, medical surgical nursing, mental health, gerontology, and much more. At the conclusion of the program, students will be capable of applying the principles of critical thinking and innovation, assume accountability for professional growth and function as a leader and agent of change, provide patient centered care to patients with diverse cultural and social backgrounds, provide safe and high quality care, collaborate with other members of the patient care team to restore health, and use established systems to manage care. Upon completion of the program, graduates can apply to the Massachusetts Board of Nursing to sit the NCLEX-RN and practice as a registered nurse. The goal of any nursing program is to produce graduates who would first be able to succeed academically then carry their knowledge and skills to the workplace where they would become competent providers of care. To meet this goal, the program may have a stringent admissions policy, including an admission exam, a personal interview and prior health care experience. Be a high school graduate with a GPA or 2.5 or better. Complete college preparatory science courses with the accompanying lab. All courses must be completed with a grade C or above. Complete college level mathematics with a grade C or better. Achieve a proficient score on the TEAS VI. Provide a letter of recommendation. The program requires a clinical experience at various health care agencies. The requirements for participation will depend on the agency, but students must meet all the requirements for placement. Requirements may include immunizations, drug screening, physical exam, drug screen, an agency specific SORI and CORI, TB test, and health and liability insurance. Massachusetts residents enrolled in a nursing program at a community college can expect to pay $267 per credit for tuition. Nursing students can also expect to have special costs related to the profession. These include nursing uniform, lab fees, background check costs, immunization cost, drug screen, nursing supplies, CPR training, and liability insurance. Textbooks, graduation fees, placement testing, and transport to the clinical sites are some other common expenses. No person may practice nursing in Massachusetts without a valid, current license issued by the Massachusetts Board of Registration in Nursing. The Board does not issue temporary licenses. Practice as a “Graduate Nurse” in Massachusetts is illegal. That state is not a member of the Nurse License Compact so all practicing nurses must have a licensed issued by the Board. Applicants for licensure must have a good moral character as established by the Board, be a graduate of a Board-approved RN education program, achieve a passing score on the NCLEX for Registered Nurses, and pay all the required fees. All applications must be submitted to PCS and be completely legible and with all the required documentation. A social security number is required to ascertain the applicant’s compliance with Massachusetts’s laws relating to taxes and child support. Complete the Massachusetts application for nurse licensure by exam as directed. The application must be complete and legible. Enclose the payment of $230 using a money order made out to PCS. Credit cards are also accepted using the payment form included on the application. Review the Determination of Good Moral Character Compliance before submitting the application if you answer “yes” to any questions related to the good moral character requirement. Staple a recent 2”x2” passport type color photo to the application. Sign the photo at the front bottom edge. Complete the Certification of Graduation Status. The administrator of the nursing education program must certify your graduation status. Official final transcripts must be sent directly to PCS from the nursing education program. Complete the verification of licensure status if you have been licensed as a nurse in any state or jurisdiction. License verification may be completed online through nursys.com or the Verification of Nurse Licensure form included in the application package. The licensing agency must return proof of licensure and current status directly to PCS. Keep a copy of the application and all other documents for your records. Register for the NCLEX-RN and review the Candidate Bulletin. Once received by PCS, the licensure application will remain current for one year pending completion of all the requirements, including passage of the NCLEX. The application will expire if the requirements are not met within the one-year timeframe. The application fee is non-refundable. Notify PCS in writing if your address changes while the application is in process. After submitting the completed forms and fee, you will receive an Authorization to Test via email. Schedule an NCLEX appointment and write the exam during the 60-day eligibility period or forfeit your fee. PCS will send the results via U.S. Mail approximately 10 business days after the test. The Board of Nursing will send the nursing licensure via U.S. Mail approximately 21 business days after the test. Your license number will be visible on the Board’s website approximately 5 business days after passing the NCLEX. Complete the Massachusetts application for nurse licensure by reciprocity as directed. The application must be complete and legible. Enclose the payment of $275 using a money order made out to PCS. Credit cards are also accepted using the payment form included on the application. Official final transcripts must be sent directly to PCS from the nursing education program. Submit a CGFNS evaluation report of foreign nursing education credentials directly from the evaluating organization to PCS. Demonstrate English proficiency if applicable. This particularly applies of you completed a non-English nursing education program. Complete the verification of licensure status from the original and current any state or jurisdiction. License verification may be completed online through nursys.com or the Verification of Nurse Licensure form included in the application package. The licensing agency must return proof of licensure and current status directly to PCS. Registered nurses licensed in Canada must submit documentation of graduation from a Board-approved program or one that is approved by a corresponding body in Canada. Candidates who wrote the CNATS or SBTPE must demonstrate achievement of the scores outlined by the Board of Nursing in Massachusetts. Candidates who wrote the CNATS after August 1, 1995, are not eligible for reciprocity. Candidates who are not eligible for reciprocity must submit an application for licensure by exam and sit the NCLEX. Once received by PCS, the licensure application will remain current for one year pending completion of all the requirements. The application will expire if the requirements are not met within the one-year timeframe. The application fee is non-refundable. Notify PCS in writing if your address changes while the application is in process. Registered nurses licensed in MA must renew their license on their birthday in the even-numbered year. If your initial license was issued within three months of your birthday, it will be valid until your birthday in the next renewal cycle. You can initiate renewal online or contact the Board in writing or email to request a paper application. You may also renew in person at the Board’s office in Boston. The renewal fee is $120. If your license expires, you must meet the renewal eligibility requirements and submit the required fees. The state does not have an inactive status. If you need to change your name, you should download the name change form and submit the request with your renewal. There is no fee for name changes initiated during the renewal period. During the renewal, you must attest to completing the Continuing Education (CE) requirements. Keep an authenticated record of your education to submit if the Board selects you for an audit. The record of CE must be maintained for two consecutive registration periods. Registered nurses must obtain 15 contact hours of continuing education before renewing their license. There is no continuing education requirement for the first renewal. All subsequent CEs must be completed within the two years preceding the license renewal date. Candidates must attest to their compliance with the state laws related to taxes, child support, mandatory reporting, and practice regulations. It is within the Board’s jurisdiction to request verification of compliance at any time. Registered nurses must keep a record of their CEs for two consecutive renewal periods. As enrolment swells in nursing schools, new graduates are forming mixed views of the much-publicized nursing shortage. The decision by older nurses to delay retirement and hospitals, on tight budgets, to reduce spending has a direct impact on the ability of new nurses to find jobs. Many of them have concluded that the shortage is non-existent as they wait significantly longer than expected to find their first nursing job. According to health officials, there’s hope on the horizon as senior nurses go into retirement and a greater number of baby boomers approach their Medicaid years, which will cause employers to implement an aggressive search for new hires. Right now, graduates have to wait at least six months to land their first job compared to graduates in past times who had a job lined up before graduation. Furthermore, the majority are accepting jobs in nursing homes and home health care as hospitals are reluctant to hire graduates of an associate’s degree in nursing programs. Nursing programs are packed to the seams producing more graduates who will be able to fill the shortage when it re-emerges. One of the best options for nurses is to prepare for specialty areas where there are countless open opportunities. Nurses who complete four-year degree programs also have better luck than graduates of two-year programs. 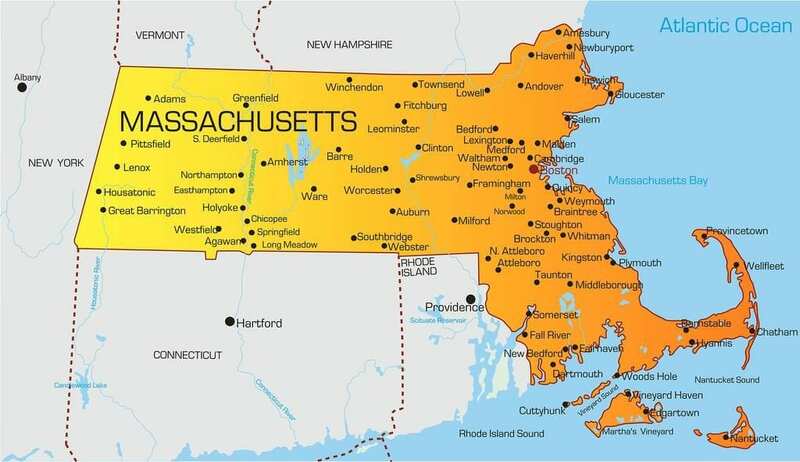 The labor markets in Massachusetts are very regional. So while there may be a surplus of nurses in metropolitan areas, there may be a dearth outside the big cities. This suggests that graduates must be willing to move to the suburbs. According to a Bureau of Labor Statistics 2015 report, registered nurses in Massachusetts earned an annual mean wage of $88,650.